News reports around the time The Agency was broadcast noted the similarity between the show's storylines and the horrifying events that had taken place in the U.S. No one suggested, however, that this similarity might have been the result of people having foreknowledge of the terrorist attacks that hit America in late 2001. But surely we need to look closer and consider whether some individuals, perhaps employees of the CIA, did indeed know about these attacks in advance and, for as yet unknown reasons, wanted episodes of The Agency to depict events similar to what was going to happen. The Agency was a prime-time TV series that told stories of life inside the CIA and showed agents tackling problems of national security. The villains they faced included Arab terrorists, Colombian drug dealers, and Iraqis. Three storylines written for The Agency are particularly notable. Two of these were made into episodes but one was never used. The storyline that was not used bore a striking resemblance to the events of September 11, when, according to the official story, Osama bin Laden had four U.S. aircraft hijacked. Michael Frost Beckner, the creator of The Agency, revealed to Variety magazine that four months before 9/11, he wrote an episode "in which bin Laden had three U.S. planes hijacked." The script, though, "was never completed." An episode of The Agency based on this plot could plausibly have been produced between May 2001, when the script was written, and September 11, when it would have become unusable. But Beckner has not said why such an episode was never made. Beckner has revealed, however, that some storylines for The Agency were suggested to him by Chase Brandon, the CIA's entertainment liaison officer (who happens to be a cousin of Oscar-winning actor Tommy Lee Jones). But Beckner has not said whether Brandon suggested to him the storyline about bin Laden having three American aircraft hijacked. When we consider the two storylines for The Agency described above--that of the pilot episode and the unused plot about three American aircraft being hijacked--it is worth noting that, before September 11, Osama bin Laden and al-Qaeda were unusual choices as villains for a major television series, since they only became well known among the public after 9/11. Beckner in fact recalled that when he first presented his script for the pilot episode to CBS, the network "had no idea about bin Laden or al-Qaeda." On another occasion before September 11, CBS told Beckner: "This al-Qaeda thing, you've got to get off that. No one is interested. Trust us." In light of the general lack of awareness of al-Qaeda at the time, therefore, it would be surprising if it was simply a coincidence that, before 9/11, Beckner was already writing storylines about attacks committed by bin Laden and his terrorist group. EPISODE FEATURED PLANNED ANTHRAX ATTACK IN THE U.S. While two of The Agency's storylines had similarities to what happened on September 11, another storyline is notable because it involved a planned terrorist attack in the U.S. using anthrax, and because, at the time the episode with this storyline was originally going to be broadcast, the U.S. was actually in the middle of a series of anthrax attacks. Considering that storylines written for The Agency appear to have predicted terrorist attacks that took place in the U.S., it is worth noting that the CIA's cooperation with the show included reviewing scripts. 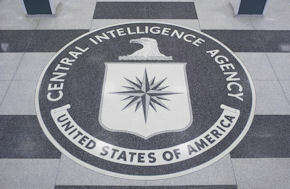 The CIA would presumably therefore have seen the scripts for "A Slight Case of Anthrax" and the pilot episode before the episodes were filmed. It would certainly be worth discovering how the agency responded to these scripts. Whether the CIA also saw the script about Osama bin Laden having three American aircraft hijacked, and, if so, how it responded, is unknown. The fact that a major TV series with storylines about terrorists and the CIA's efforts to tackle them was ready to air within weeks of 9/11, when terrorism suddenly became a major concern, seems a remarkable coincidence. A question to consider is whether it was just a coincidence that The Agency was ready to be broadcast just after September 11, when the American public needed to learn "the magnitude of what's at stake" and get "a sense of reassurance." Or could the show's timing have come about because some people in positions that enabled them to influence what programs a TV network produced had foreknowledge of 9/11 and the "war on terror" it would initiate? They therefore wanted programs made that would immediately be ready to fit in with the new reality that would emerge after September 11. Likewise, could the resemblance of some of The Agency's storylines to 9/11 and the anthrax attacks in the U.S. have been the result of people having foreknowledge of these events? CNN suggested that the similarity was because the producers and writers of The Agency "read intelligence manuals, pull from actual CIA cases, and confer at length with the show's consultant, retired [CIA] operative Bazzel Baz." However, Michael Frost Beckner revealed that these storylines were suggested to him by the CIA, via its entertainment liaison officer. This surely indicates that some people at the CIA had foreknowledge of 9/11 and the anthrax attacks. This issue should clearly be examined as part of a new investigation of 9/11. That investigation would need to find out what was known, and who knew it. Lauren Hunter, "'The Agency' Finds Art a Little Too Close to Reality." CNN, October 31, 2001. Tricia Jenkins, The CIA in Hollywood: How the Agency Shapes Film and Television. Austin, TX: University of Texas Press, 2012, pp. 55, 65-66. Elaine Sciolino, "Cameras Are Being Turned on a Once-Shy Spy Agency." New York Times, May 6, 2001; John Patterson, "The Caring, Sharing CIA." The Guardian, October 5, 2001. Duncan Campbell, "Hollywood Helps CIA Come in From the Cold." The Guardian, September 6, 2001; Julie Salamon, "Two New Spy Series at Unexpected Risk." New York Times, September 29, 2001. Ed Bark, "CBS' 'The Agency' Skips Terror-Themed Episode." Dallas Morning News, September 27, 2001. Philip Taubman, "Making Over the Central Intelligence Agency." New York Times, August 26, 2001; Tricia Jenkins, The CIA in Hollywood, p. 56. Brooks Boliek, "CIA Calls off 'Agency' Plan." Hollywood Reporter, September 17, 2001; Ed Rampell, "Hollywood's Year of Living Clandestinely." CounterPunch, May 2013. Army Archerd, "Art Imitates Life, Sort Of." Variety, November 20, 2001. Tricia Jenkins, The CIA in Hollywood, pp. 65-66. Ed Rampell, "Hollywood's Year of Living Clandestinely." Tricia Jenkins, The CIA in Hollywood, p. 66. Ed Bark, "CBS' 'The Agency' Skips Terror-Themed Episode." Tricia Jenkins, The CIA in Hollywood, p. 63. Julie Salamon, "Two New Spy Series at Unexpected Risk"; Tricia Jenkins, The CIA in Hollywood, pp. 62-63; Ed Rampell, "Hollywood's Year of Living Clandestinely." Noel Holston, "Three New Spy-Themed Series Also May End up Victims of the Terrorist Attacks on the World Trade Center and Pentagon." Newsday, September 22, 2001. Julie Salamon, "Two New Spy Series at Unexpected Risk." "Reworked Agency Pilot to Air Nov. 1 on CBS." South Florida Sun Sentinel, October 25, 2001; Lauren Hunter, "'The Agency' Finds Art a Little Too Close to Reality." Tricia Jenkins, The CIA in Hollywood, pp. 66-67. "Critical Issues in Writing About Bioterrorism." Hollywood, Health & Society, April 2, 2002. Tricia Jenkins, The CIA in Hollywood, p. 56. Duncan Campbell, "Hollywood Helps CIA Come in From the Cold." "Critical Issues in Writing About Bioterrorism." Eric Deggans, "Leave Attacks' Aftermath to Real Life." St. Petersburg Times, October 29, 2001; Bridget Byrne, "'Anthrax' Shows up for Sweeps." E! Online, November 2, 2001; Stephen M. Silverman, "Fictional Anthrax Hits 'The Agency.'" People, November 6, 2001; Tricia Jenkins, The CIA in Hollywood, p. 68. "CBS Pulls Anthrax Episode of CIA Drama 'The Agency.'" Associated Press, October 17, 2001; Bridget Byrne, "'Anthrax' Shows up for Sweeps." Stephen M. Silverman, "Fictional Anthrax Hits 'The Agency.'" Bernard Weinraub, "The Moods They Are a'Changing in Films; Terrorism is Making Government Look Good." New York Times, October 10, 2001. Tricia Jenkins, The CIA in Hollywood, pp. 55, 61. Patrick Goldstein, "The CIA Spins Itself." Los Angeles Times, September 29, 2001. Brian Lowry, "TV Viewers Flock to What is Familiar." Los Angeles Times, October 2, 2001. Patrick Goldstein, "The CIA Spins Itself." Lauren Hunter, "'The Agency' Finds Art a Little Too Close to Reality." Note that this blog entry is intended as a follow-up to my previous article, "Hollywood and 9/11: The Movies and TV Dramas Resembling the Terrorist Attacks That Were Being Produced in September 2001." Shoestring on Wed, 06/19/2013 - 9:57am. I figure the reasoning behind this is likely at least in part a practical matter of crafting the narrative. The people who coordinate such false flag attacks are obviously analytical types who calculate how popular perception can be manipulated through specific events, but it takes creative minds to weave details into such events which create narratives that most won't think to question, and that's what the scriptwriters in Hollywood and such specialize in. So, if for example one wants to create popular support for the invasion of the Middle East to stuff the pockets of war profiteers while simultaneously stripping civil liberties in the name of security, just come up with a basic layout of Muslims carrying out horrific attacks on us, pass it off to some script writers create stories about such, and take what seems best from those scripts to round out the plan. Of course I'm just speculating here and I don't rightly expect any evidence could be uncovered to confirm my suspensions, but I figured I might as well put them out here for others to consider. Anyway, impressive work as usual Shoestring, seeing the fruits of your research is always a pleasure. Pavlovian Dogcatcher on Wed, 06/19/2013 - 12:25pm. I guess these scripts help to prep the public mind for accepting a false narrative, ie. false flag. So less resistance to a false flag. And because some of these narratives are so blatant and in-your-face, it might intimidate good people from speaking out who are in a position of power. In this way, it keeps sleeping minds asleep and psychologically bullies those who are awake. RL McGee on Wed, 06/19/2013 - 1:59pm. mentioned yet is that this type of " false flag drill" is the perfect opportunity to recruit and test mind controlled players to support the game narrative, and/or possible patsies. foxii on Wed, 06/19/2013 - 4:54pm. and don't forget this episode of the lone gunman which aired in may , i think, of 2001, and featured hijacked planes heading for world trade center, under remote control, and which were able to be swerved at the last moment. i wonder who suggested that plot line? it does seem like scenarios preparing the public mind to accept them as normal and not out of the ordinary. thymesup on Thu, 06/20/2013 - 2:16pm. When we consider the two storylines for The Agency described above--that of the pilot episode and the unused plot about three American aircraft being hijacked--it is worth noting that, before September 11, Osama bin Laden and al-Qaeda were unusual choices as villains for a major television series, since they only became well known among the public after 9/11." Now this is truly bizarre. By the beginning of 2001 both the bombing of the US embassies in east African that had killed over 200 people and the Cole bombing had already taken place and were directly linked to bin Laden and al Qaeda. These stories were front page news for weeks in almost all of the major papers in the US. The account of the Cole bombing also indicated that another ship the USS the Sullivan’s had been unsuccessfully attacked by the same al Qaeda terrorists in January 2000. Anyone with even half a brain could assume after that Cole bombing information came out and knew about the 1993 attack on the World Trade Center Towers in 1993, that the al Qaeda terrorists we for sure going to go back after the WTC towers again. This didn’t take any brains. When the US intelligence agencies received massive warnings starting in April 2001, about a huge al Qaeda terrorist attack about to take place inside of the US, it is impossible to believe that they did not know that this attack would be against the World Trade Center Towers, particularly since June 12, 2001 the CIA had been told that Khalid Sheikh Mohammed was the mastermind behind this new attack and the CIA already had his Bojinka plot, a plan to hijack multiple aircraft inside of the US and crash these planes into the World Trade Center Towers, the Pentagon and the US Capital building. rschop on Fri, 06/21/2013 - 1:37pm. All the same, I still think that Osama bin Laden and al-Qaeda were nowhere near being household names before 9/11. I certainly cannot think of any TV series or movie that came out before 9/11 in which "al-Qaeda" featured as the enemy. And yet--if you include the unused storyline featuring three plane hijackings and the original version of the anthrax episode--Michael Frost Beckner wrote three scripts for The Agency in which bin Laden and al-Qaeda were the bad guys. Shoestring on Sat, 06/22/2013 - 10:34am.